Facebook's users upload millions of photos daily, and Facebook has added functionality to add tags to identifying the people in them. Just a few days ago, we found out that Facebook is scanning, with facial recognition software, every single picture that is uploaded to their servers and grouping similar faces. Doesn't this creepy you out? Its grouping even non-Facebook members. Yes, you get a message when people tag you but Facebook is storing this information. What could they do with this data? The company could use it to sell you advertisements or even be used against you in court with a subpoena. If for any reason you don't want your name to be suggested, you will be able to disable suggested tags in your Privacy Settings. Just click "Customize Settings" and "Suggest photos of me to friends." Your name will no longer be suggested in photo tags, though friends can still tag you manually. You can learn more about this feature in our Help Center. Be aware of what Facbook does and speak out. If we are not heard we might have a new Big Brother. Suggestion: Post your opinion in their Help Center. After creating a list, head over to Chat and click the green toggle button to set your self as Offline to those individuals. Facebook Filters Your Wall Feed? and you are done. Now you will receive updates from all your friends! Which parts give me the best performance for the price? How do the prices compare across multiple merchants? Happy building and thanks to my co-worker David R. for the Tip. Now that finals are done, I will be posting more often. Also, I can not believe I did not think of this tip earlier. Many students use their calculator for math to compute long tedious commutations. Why not use your calculator to hold notes? I found a handy app for TI 83 and Ti 84 plus calculators which is a basic text editor. This app is called NoteFolio™. It can store as many notes as you please(Memory allowing). I have used this to store poems, key facts, equations and many other things. To add this app, make sure you have the USB cable for your calculator, the TI Calculator software installed, and a good set of batteries. Next, install the TI Notefolio Creator program on your computer. This program allows you to type up your documents with your PC. Lastly, open the Notefolio Creator program and if the app did not install on your calculator go to Actions-> Send Notefolio app. Then, create a note and once finished send the note to your calculator by Actions-> Send to Device. Your done! Please use this at your own risk ;-). We all have seen how every time we re-start our computer Adobe is installing and updating their software, like Adobe Reader. Adobe Reader has been a defacto on all machines to view PDF's but did you know that lately Adobe has a lot of issues with security. Hackers have targeted Adobe to get into your computers. Why not get rid of Adobe reader by uninstalling it and using Chrome? Here is how to do it. Make sure you have Chrome installed. Find a PDF on your system and right-click it, then click "Open With...". A window should pop up with programs to choose from. Make sure there is a check box that is checked on the bottom that says "Always use the selected program to open this kind of file". Make sure you have Chrome selected. If you do not see it click "Browse...". If you know where Google has been installed, then just browse to that location otherwise, you can right-click on the Chrome shortcut then, Properties->Shortcut. You’ll see the location(address) in the Target box. Copy it over to the previous window and you are set to go. First you’ll need to download Astro or some other File/App manager from the Android market. Next download the zip with both apks here. Place the apks on your sd card and install them with Astro. Once installed all you have to do is go to the Android settings -> Language & keyboard, under Keyboard Settings you’ll see HTC_IME mod and a check box next to it, check it to make it your primary input method. Below the check box you’ll see the settings menu click on that and customize to your hearts desire. After selecting the site, press ok, and a new small window should appear. In that window, go to the top of it and select the maximize option. Website Wallpaper NOTE: Website animations do work! If your desktop computer begins to shut down and you notice it runs really hot, you might consider doing some maintenance. It is pretty cheap to do so! The easiest thing to is buy compressed air to blow out the dust bunnies. The usual culprits are the CPU or if you have one, the graphics card. To diagnose, you can use software like Speedfan or even the BIOS. The BIOS is a menu you can go into before Windows even loads. You can also test stress by playing a video at full screen or running a program that works the CPU at 100%. There is also software out there that will stress test such as Everest and Sandra. Hope it helps! If you been following my posts on subjects related to Apple, you would probably pick up the fact I like Mac OS X and its features but I loathe how expensive the hardware has been these last few years if not always! Well introduce Hackintosh! A Hackintosh computer is basically a "PC" running the Mac OS X operating system, that's it. 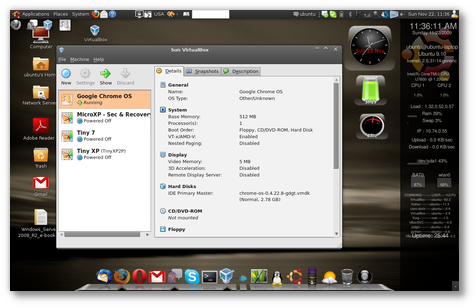 The difficult part is getting the "PC" hardware to work with the Mac OS X software. Over the years, it has become easier to achieve such goal, as Apple has made decisions to use Intel processors, both NVIDIA and ATI graphics cards if not mistaken and is even rumored to soon switch to AMD processors. Then again, building a Hakintosh is NOT completely legal, but there are plenty of guides out there to different ways to carry out the experiment. Because it is an experiment, there is no guarantee it will be 100% functional, but I think the benefits out-weight the negatives. Why would anyone build such a monstrosity? Well, it is cheaper. A build costing about $800 will outperform the best iMac and it's the same for the Mac Pro. Also, the build will perhaps have better quality parts than what Apple uses as the user gets to choose all the hardware. Finally, it will teach a person about computers! Do at your own risk and happy building! Have you ever wanted Santa to call you? Well now you can offer that which you could not hear to someone else, kids would really like this. There is a site set up by Google called Send A Call from Santa. The site enables the sender (you) to compile a personalized messaged using the template and options they provide. In addition they allow you to preview the message. You may send this message via e-mail, phone or Facebook. If you are using the phone option you must provide your number and the person whom you wish Santa to call. Although note there is a bit of advertising for Google Voice following the message. [caption id="attachment_2295" align="aligncenter" width="300" caption="Image from W3 Schools"] [/caption] A couple years ago when MySpace was the place to be, I taught HTML in a course at a youth center in which they created their own myspace profile from scratch. In order to prepare some lessons and teach the kids new codes, I would reference w3schools, an online tutorial site, that provides the tools to create a website. One specific feature I enjoy is the try it out editor which enables you to view the code and the output on the same screen (as shown below). I recommend this site if your are interested in learning more about web design and creation. With the inertia of my previous post on SDD’s, they are still high priced compared to hard drives but there does exist a happier and much faster medium, which when used correctly, has the possibility to perform just as well if not better than SSD’s in some scenarios. This happy medium turns out to be your RAM. If you have more than 4GB of RAM, I recommend you download Dataram RAMdisk. Essentially, the utility uses RAM instead of writing the data to your 200X slower hard drive. The program will create a hard drive with a TEMP folder. To configure, simply specify how much RAM should be allocated as the hard drive and individually modify each program to store its temporary files in your RAM hard drive. You may wonder how this is useful and not tedious to modify each program altogether? It turns out there are programs that write to the hard drive more frequently than others. The main culprits turn out to be your internet browser and installation executables. Check with your preferred browser. I know for a fact Chrome will not let you change its TEMP folder directly, but as always, if there is a will, there is a way. As for the installation executable, modify the environment variables to point to the RAM hard drive. In my case, “I” is my RAM hard drive. The only downside is that because RAM gets deleted at shutdown, so will any temporary files get deleted; in other words, the temporary files that could have speeded up your page loading will not be there. If you think offsetting the cost of slower page browsing is negligible, proceed. If not, simply do not modify the browser's settings. Ever heard of RAID? No, I am not talking about pirates getting away with treasure. RAID stands for Redundant Array of Independent Disks. As hard drives approach the Terabyte range (1000 Gigabytes), they have become inexpensive to the point where RAID becomes a consumer level alternative to the trendy Solid State Drives (SSD’s). The advantage over SSD is there no finite amount of data writes but of course mechanical failure is always eminent. To do so, you will need to back up your data, purchase identical drives, most likely have to purchase a RAID controller and be willing to get your hands dirty to install the additional hardware under the assumption your PC system meets the requirements. You can read more about RAID on your own, but my preferred configuration is a RAID 0+1. My preferred configuration gets the performance boosts by splitting (stripping) the data into two drives as shown below and backs up ( mirrors) the entire data into a third drive.